As a science journalist, Jean Pütz has produced more than 3,000 TV shows, contributing in an extraordinary way to making science and technology popular. An audience of millions came to know him in particular through the German television show “Hobbythek” as well as through “Wissenschaftsshow” and further television formats. In “Hobbythek,” Pütz drew parallels between science and people’s everyday lives in a unique way. Public broadcaster Westdeutscher Rundfunk (WDR) ran the show for 30 years, from 1974 to 2004. Its episodes encouraged people to perform do‐it‐yourself projects. Accordingly, Pütz can also be described as a cultivator of the DIY movement. Audiences had an opportunity to request printed “hobby tips” for free, and then create projects involving items like cosmetics or yogurt. “I wanted to show people they are smarter and can do more than they think,” says Pütz, who has additionally published around 80 popular science books. More than six million copies of his books have been printed in total and have presumably reached an even higher number of readers. Due to his background in electrical engineering, Pütz possessed the technological expertise regarding scientific developments more than other science journalists. His extremely easy to understand and practice‐oriented book “Einführung in die Elektronik” (Introduction to Electronics) was the decisive nudge for some young people to explore the potential of modern electronics and digital technology. During his first years in the professional world, Pütz had a teaching position in electrical engineering at a school of applied sciences in Cologne. He not only distinguished himself as a journalist through his instinct for subjects and their creative implementation, but also through his didactic skills. As long‐time Natural Science Editing Director at WDR, Pütz additionally played an important role in discovering and promoting talented young and upcoming journalists. To cite one example: Physicist Ranga Yogeschwar started his career in the 1980s with WDR and quickly became a big brand in his own right in German science journalism. From the beginning, Jean Pütz cared not only about imparting useful knowledge; he also viewed educating the population in the natural sciences as a central requirement for democracy. For him, it was and is a social and political obligation to bring people closer to science. After all, those who are unable to understand and comprehend how topics interrelate believe everything they hear and become susceptible to demagogues. Many of the topics Pütz and his shows explored were socially relevant. 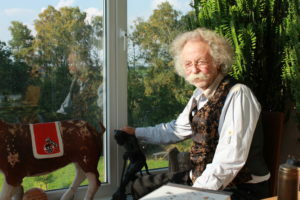 Jean Pütz has especially earned recognition through his engagement in the German Science Journalists’ Association (WPK in its German abbreviation), which has meanwhile become a professional association. Pütz was one of the Association’s founding fathers. When the WPK was founded in Bonn in 1986, science journalism could only be found in a few niches. The daily science page in newspapers hadn’t been invented yet, and there were hardly any science formats in prime‐time television. That all changed throughout the course of the 1990s, which from today’s perspective can be seen as the boom in German science journalism. An important role in that development was played by the WPK and Jean Pütz, who was the WPK’s chairman for 13 years and was passionately engaged for the future of science journalism in that capacity. Still today, he is a member of the WPK Advisory Council, which advises the management board. Pütz, who was born in Cologne in 1936, remains active in science education today. With his “Pütz‐Munter‐Show,” he tours the country, inspiring young and old alike with his impressive experiments that also evoke reflection. He additionally leverages modern digital media to promote dialog between science and society. Pütz uses Facebook and blogs to provide information on current affairs and developments, commenting with a critical perspective. In 2017, his biography “Ich hab’ da mal was vorbereitet…” (I’ve prepared something) was published. That became the trademark line of the Hobbythek host, who always came on screen with his distinctive moustache. The motivation behind his journalistic work is tangibly reflected in this quote by Pütz: “From the start, it was clear to me that democracy can only be attained when people comprehend why science must exist and why technology has made life easier.” In this age of fake news, it becomes blatantly obvious how important this kind of information is for society.